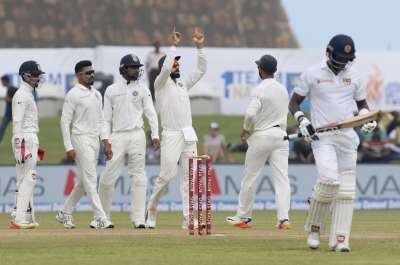 Galle, July 28 (IANS) Sri Lanka struggled to 289/8 in their first innings as India strengthened their position at lunch on the third day of the first Test at the Galle International Stadium here on Friday. The hosts now trail by 311 runs with Dilruwan Perera unbeaten on a gritty 90. Lahiru Kumara was batting on 2 at the other end. Pacer Mohammed Shami returned with figures of 2/45 for India while left-arm spinner Ravindra Jadeja got 2/67. Perera and Angelo Mathews started the day on a steady note for Sri Lanka, handling the bowling of Umesh, Jadeja and Ravichandran Ashwin quite comfortably. The duo batted out the first hour with ease, putting together a partnership of 72 runs. 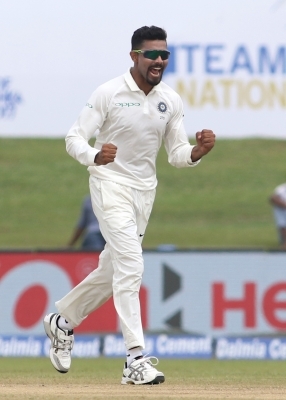 Jadeja, however, got the breakthrough with the first over of his second spell when Mathews mistimed his drive while trying to smash the ball over the in-field cordon. It was a poor shot selection from Mathews in the given situation. The right-hander produced an excellent knock of 83 runs, smashing 11 boundaries and a six during his 130-ball stay in the middle. Perera, however, continued to fight on even though wickets kept falling at regular intervals at the other end. 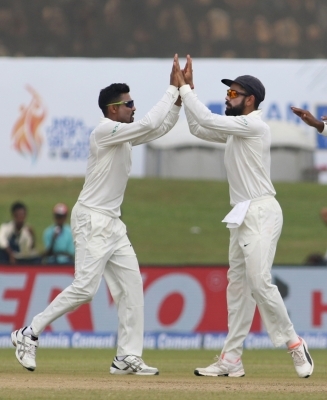 Sri Lanka (first innings): 289/8 (Dilruwan Perera 90 batting, Angelo Mathews 83; Mohammed Shami 2/45, Ravindra Jadeja 2/670) vs India (first innings): 600.